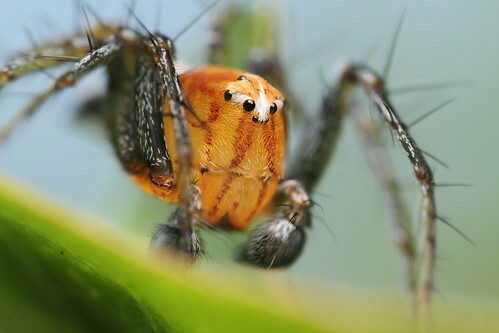 Shallow depth of field is considered a mayor problem taking macro images in magnification higher than 1:1, as most of the subject is out of focus. Several techniques developed to increase the depth of field, I'm not defending one against another because I use most of them in a daily basis. The history of this post is how to use successfully a wide aperture (relatively in extreme macro terms) in one single image still preserving the interestingness. The main shortcoming is finding a suitable subject that has enough of the body geometry in a flat plane in order to allow the shallow DOF to cover enough area for detail perception. 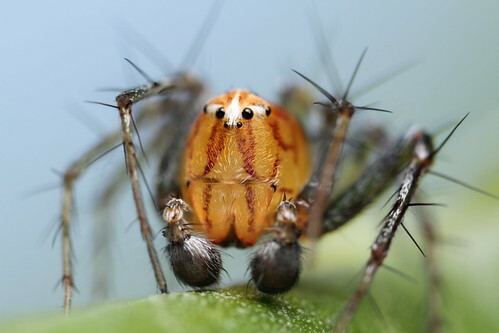 The lynx spider is one of these suitable subjects. These photos were taken with Canon MP-E 65mm macro photo lens @ 3x magnification and f/6.3, the effective aperture is about f/22 , doesn't look like a lot of aperture, but successful extreme macro shooters that made most of the images single framed usually goo to effective apertures of f/50 or more (flash required). There were advantages of taking the shoot at a wider aperture, it allows more natural light to participate in exposure creating a natural light background, it allows a reduced flash time for the needed exposure and reduce the diffraction softening creating more interesting detail in the in focus area. The subject is still exposed by flash, if the flash fails will result in a shadow image were the spider is, the flash is important to preserve detail too, it stops the motion and prevent macro motion blur, flash power is defined as duration of the pulse, the shorter the pulse the more chance of getting a sharp macro and the wider the aperture the shorter the pulse. Superb!! I actually like a shallow DOF in macro work, especially plants. Insects on the other hand are tricky as they move! Exquisite photo! Thank you for sharing the technique and knowledge. Thanks folks, better to take advantage of some optical characteristics of the high magnification than consider it as difficulties. These shots are absolutely stunning. i like the angle you got at to take them too.